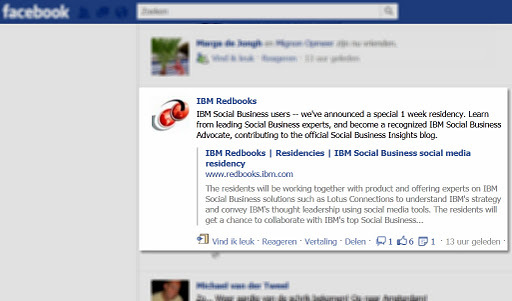 In 2009 I had the honor of being chosen to be a part of the last formal Redbook by the Lotus brand. It was the “Self Assessment and Strategy Guide for Migrating from Domino Document Manager” Redbook. A Redbook that tried to help customers on DomDoc make their choise as to how to migrate of that platform as it was being discontinued. So that Friday morning in 2009 when my boss sent out a message asking if there was anyone interested in doing a Redbook I lept at the opportunity. I never even hesitated and just replied immediately. This was my chance, and I had to take it! Two weeks later after a couple of hectic weeks arranging things, I boarded a plane for a 3 week residency in Cambridge, MA. It was everything I hoped for. The discussions we had as a team and with product specialists, developers and Brand managers of IBM. The opportunities we got, to see new developments, test them and write on them and the feeling of being able to create something that would help thousands of people do their migration… It was better then I had hoped for. But it was hard work too! The 3 week residency itself was only the beginning. After that a 6 month period of writing, revising, rewriting and discussing (skype) started. All of which happened mostly at night or in weekends as my daily job didn’t stop either.Part of my task was to write a chapter on the comparison between Quickr and DomDoc and a chapter that outlined a step-by-step actual migration using a migration tool. I think I did at least 50 test migrations for that one alone. There were times that I got really fed up by it all. So when the postman finally came to deliver that hard copy of the Redbook with my name on it. I was sad and happy at the same time. It had been hard work but it was so rewarding. Most importantly it showed me that I had something to offer. Be it small, I could actually help other people. For someone who used to be very shy and insecure that was a real eye opener.Since then I’ve become more outward going, wrote blogs and articles, spoke at conferences, became very active on Social Media and connected more to other people in the professional community. No wonder that when I saw this on facebook last night…. ….I couldn’t help but jump for it again. It might not be a Redbook in the way I did it before, it does incorporate everything I love and do so I would be crazy not to! At the same time I’m aware that this Residency is going to be really popular and that my chances of being picked are slim at best. But if there’s anything I learned from my Redbook experience it is that you have to grab any chance you get! Besides, even if I don’t get picked I still got the thrill of reliving the great times I had again. So if you are considering nominating yourself but not yet sure?… I can say only one thing: Go for it, take that chance! This could change your life. It did for me!